To become a real estate agent in Arizona, you must meet state-specific prelicensing education requirements, submit paperwork, and pass the state exam with a score of 75% or better. Successful agents typically take practice exams as well as study state-specific laws to pass. Once licensed, complete the required continuing education credits every two years. The Arizona licensing exam covers a huge amount of information, so it’s important to prepare. Real Estate Exam Scholar is a real estate exam prep crash course that can help you pass Arizona’s real estate licensing exam. The Salesperson Exam Prep Course costs only $29 and includes six months of access to more than 1,000 practice questions, flashcards, and more. Click below to find out more about Real Estate Exam Scholar’s 95% pass rate and money-back guarantee. 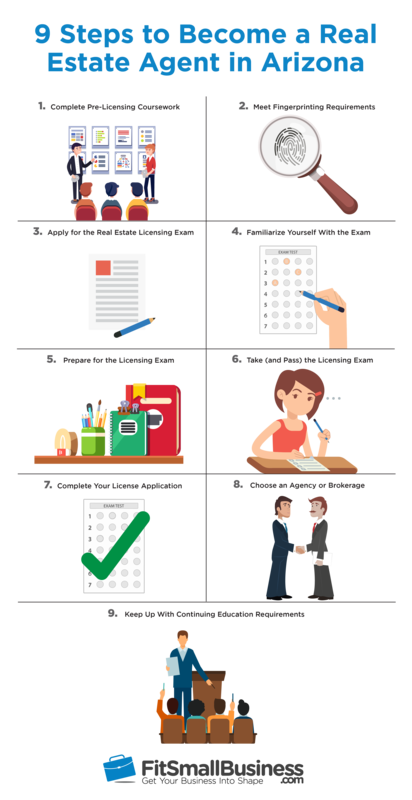 To ensure you complete all necessary coursework, pass the real estate licensing exam successfully, and collect required documents for your license application, be sure to use this checklist. It covers all of the steps to getting your real estate license, ensuring your path to real estate success is as smooth as possible. Getting a real estate license in Arizona is easy compared to other states. Applicants are required to take 90 hours of prelicensing coursework, submit materials like fingerprints and disciplinary action disclosures, and take a contract writing class. Aspiring agents and brokers must also pay a licensing fee and take the state and national portions of the licensing exam. 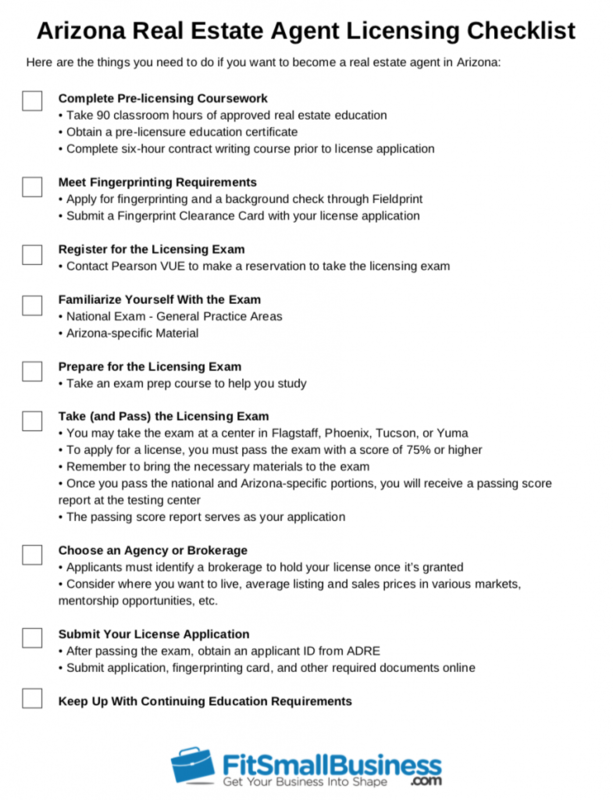 In general, aspiring real estate agents in Arizona must take prelicensing courses, register and prepare for the state-specific and national portions of the real estate licensing exam, and pass the exam with a score of 75% or more. Once you take and pass the exam, determine the market where you want to work and research brokerages to find what best fits your needs and interests. Once licensed, keep track of continuing education requirements to stay compliant with the state licensing board. Getting a real estate license in Arizona is rather easy compared to other states, and you can take the necessary courses online. You only need a total of 90 classroom hours of commission-approved prelicensing courses. In comparison, to get a license in Texas, real estate licenses require applicants to complete 180 hours of courses. Note that the contract writing course does not need to be completed prior to registration for the licensing exam or prior to passage of the exam. However, a certificate of completion must be included with your ultimate license application. For information on where to enroll in prelicensing classes, visit the Arizona Department of Real Estate. Prospective agents must submit an Arizona fingerprint clearance card when they apply for an agent’s or broker’s license in Arizona. 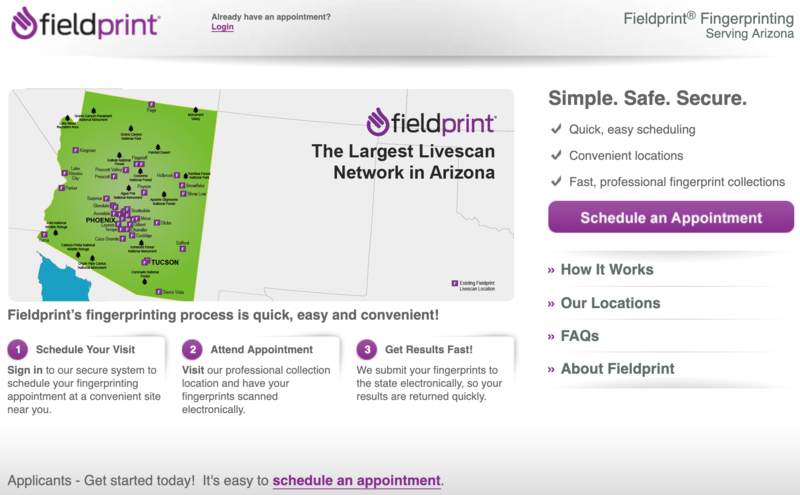 The fingerprinting process must be initiated through the Fieldprint website where applicants schedule an appointment at a Fieldprint location, pay the application fee, and complete necessary fingerprinting and background check requirements. Once completed, applicants must receive their fingerprint clearance card by mail before applying for a license. Screenshot of Fieldprint user dashboard. Once you have taken the required prelicensing courses, you will have to pass the school’s final examination. If you pass this exam, the school issues a prelicensure education certificate, which demonstrates that you have met all of the prelicensure education requirements. After you receive the necessary documents from your prep course, contact Pearson VUE, the testing administrator, to make a reservation to take the exam at least 24 hours before the testing date. The fee to take the licensing exam is $75 for a real estate salesperson and $125 for a real estate broker. If you are retaking a portion of the exam, the fee is the same as to take the entire exam. You can also access the most current fee schedule on the Arizona Department of Real Estate website. Once registered, you will receive a registration confirmation number, which you must take with you to the examination center; the exam is currently only offered in Flagstaff, Phoenix, Tucson, or Yuma. The Arizona examination has two parts that test national and Arizona-specific content and both are required to sell real estate within the state. Applicants can take the exam as many times as needed to pass but must reregister each time. If a test taker fails to pass a portion of the exam, he or she may retake just that part. The national real estate exam consists of 80 multiple choice questions, and test takers must answer 60 of them correctly to pass. Subject areas on the national exam include real property characteristics, property valuation and appraisal, contracts and buyer and seller relationships, and more. Approximately 10% of the questions involve math. The Arizona-specific section of the exam includes 60 multiple choice questions, and test takers must answer 45 questions correctly to pass this portion of the exam. These questions cover topics including real estate statutes, property interests and tenancies, tax issues, and more. Generally, there are four questions in the Arizona-specific exam that require math calculations. For a complete outline of the subjects tested in the national and Arizona-specific exam, check out a recent real estate salesperson exam outline. The national and Arizona-specific portions of the real estate exam cover a broad range of topics — some of which require mathematical calculations — and you’ll need to recall a large volume of information quickly and accurately to earn a passing score of 75% or higher. For that reason, it’s important to take a practice course and take practice exams in addition to the required prelicensing education. Check out our guide to Real Estate Exam Prep for a list of options. If you work hard and take the courses seriously, you should have no problem passing the exam. For help studying for the test, we recommend Real Estate Exam Scholar’s exam prep course. It offers top-notch exam prep for an affordable price. Even better, it also offers a money-back guarantee if you don’t pass on the first try. Click here to learn more about how Real Estate Exam Scholar can help you prepare for the Arizona licensing exam. Examinations are given by appointment only and must be taken at a testing center in Flagstaff, Phoenix, Tucson, or Yuma. Arrive at the testing center at least 30 minutes before the exam is scheduled to begin and provide the original prelicensure education certificate you received upon completion of the prelicensing courses. Test takers must also present two government-issued IDs with photo and signature as well as certain additional documentation. if applicable. You may be required to reregister for the exam if you do not have the proper identification or other required documentation. Once you receive a passing score report for both the national and Arizona-specific portion of the exam, you can use them to apply for a license. To become a real estate agent in Arizona, you must identify a brokerage to hold your license once it’s granted. If you plan to stay in your current market or already have a relationship with a successful brokerage, the decision will be easy. However, if you’re considering a new market or need guidance regarding earning potential at various agencies, we compiled data for some of the top performing teams in the state. What are average commissions and how are they split with other agents? What resources are available to new agents? Is there a mentorship program in place? Will the brokerage/agency pay for marketing resources and advertisements? To make your choice a little bit easier, check out our in-depth guide to choosing the right agency to join. For further guidance on where to work, check out our buyer’s guide comparing Keller Williams, RE/MAX, and Century 21. Arizona doesn’t have mutual recognition agreements with any state, so you cannot get a license to sell real estate in Arizona without meeting state requirements. What’s more, Arizona is a physical location state, which means that out-of-state agents must conduct Arizona business remotely and cannot enter the state for showings, closings, or any other business reason. Check out our guide on real estate license reciprocity and portability to learn more about out-of-state licenses in Arizona. After passing both sections of the real estate licensing exam, you will receive a score report at the testing site; this report serves as the core of your application, which you can submit online. You have one year to apply for your license after completion of the testing requirements. To submit your application, you must wait to receive an applicant identification number from the Arizona Department of Real Estate (ADRE). The ADRE will also provide login information for Arizona’s Online Licensing System where you can submit your application, fingerprint clearance card, proof of contract writing course attendance, and evidence of legal presence in the state of Arizona. A full checklist for submitting your license application is available through the ADRE website. To renew their license, an Arizona real estate salesperson must take 24 hours of ADRE-approved continuing education (CE) courses every two years. Similarly, brokers must complete a total of 30 hours every two years. All CE credits must be completed and uploaded to the Arizona Department of Real Estate website. Real estate agents and brokers must also take an additional six continuing education credits that don’t overlap with mandatory courses. Click here to search for continuing education classes in Arizona. How Much Does a Real Estate Agent Make in Arizona? On average, real estate agents in Arizona earn a salary of $69,054 per year. Salaries range from $21,554 to $177,882 and depend on the number of transactions agents complete, the commissions paid to their brokerage, and how commissions are split as part of the transaction. How Much Does It Cost to Go to Real Estate School? The cost of real estate courses varies by state and depends on which provider you choose. In general, expect to pay $200 to $1,000 for real estate school prior to registering for the licensing exam. You may also wish to take an exam prep course, which ranges in cost from free to $200. How Long Does It Take You to Get Your Real Estate License? It can take about eight weeks to meet the real estate education requirements for getting a real estate license. However, depending on the courses you take, this time period can be reduced to several weeks or extended over six months. Applicants must also get fingerprinting, which can take eight to 10 weeks. Can I Get an Arizona Real Estate License Online? You cannot complete all of the Arizona real estate licensing requirements online. First, there is not an online option for the required prelicensing courses. What’s more, applicants must take the national and Arizona-specific real estate licensing exam at one of the testing locations in Flagstaff, Phoenix, Tucson, or Yuma. Becoming a licensed real estate agent in Arizona requires completing prelicensing education requirements and passing the national and state-specific exam. Following the completion of state licensing requirements, aspiring agents should then identify a market and brokerage where they’d like to work and maintain the required continuing education credits every two years. If you’ve taken the prelicensing course requirements and registered for a test day, start preparing for the exam with Real Estate Exam Scholar. Exam Scholar is the most cost-effective exam prep service available online and provides users with six months of access to a ton of valuable test prep content. Click below if you want to obtain your real estate license in Arizona and need help with exam prep.